Justin phoned me on Thursday night to ask if I fancied going up to the Wye on Saturday for a days barbel and chub fishing and of course I didn’t need asking twice! 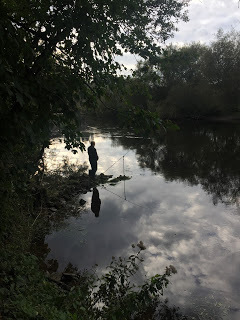 Regular readers will remember I’ve fished the Wye with Justin and the Stour with Hurf in a bid to beat my long standing personal best barbel of 6lb 11oz (caught at the Royalty) but blanked both times. Despite not catching anything they were both very enjoyable days in great company but I was hoping it would be third time lucky today. 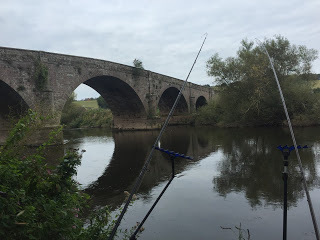 Justin has been fishing the Wye a lot and a few weeks back went up with Hurf and Fred and they caught some good fish including barbel to over 8lb and chub to over 5lb. I met Justin and we picked Fred up en route, on the way he said that they’d fished a new stretch last week and we were going to try it again today as they’d caught well. He did also say that when he’d booked it some anglers had fished it yesterday which probably wouldn’t do us any favours. We were soon pulling up at the river and the first swim was literally right by where we parked the car (my kind of river fishing!). 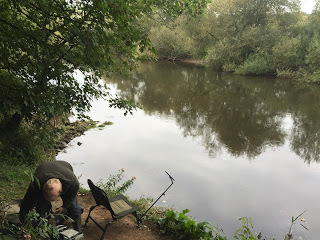 Justin said they’d caught fish straight away from this swim last time so we started setting up while Fred walked up a bit further to a bend where he’d had a couple of fish. Rigs were simple sliding cage feeders and the hooks had a hair rigged bait spike on which we mounted pre drilled pellets. For the feeders we had groundbait packed with hemp, corn and various pellets. Justin did comment that the level was a good foot down on last week and the river was quite low and clear. After around an hour we’d had no indications so we moved down to a swim just above a road bridge where they’d also done well. It looked lovely and we were soon settled in and casting towards the middle arch, we started to get some knocks which Justin said were probably chub. Fred phoned and said he’d already had a decent barbel around 8lb so hopefully we’d get a chance soon. Then Justin’s rod hooped over and he was into a fish only for the hook to pull out, it went a bit quiet after that and we were just contemplating a move when I’ve had my first proper bite but as soon as I’ve struck it was already solid and it was 2-0 to the barbel. There was quite a bit of kayak and canoe traffic and one capsized depositing three blokes into our swim, we didn’t laugh, much! The next bite came on Justin’s rod and he was into another fish but this one came off and on closer inspection, the hook had been straightened out and things weren’t going to plan. I phoned Fred to see how he was getting on and he said he’d had another barbel, this one around 6lb so at least somebody was catching. We moved swims again but no indications after an hour so we dropped back into the first swim for half an hour on our way back to the bridge but still nothing doing and I was facing my third barbel blank on the trot. With about an hours fishing left we went back to the bridge swim and I thought the rest might have done it some good and with the light starting to fade as well, maybe we would get another chance. Time was ticking by and the tips remained motionless, Justin started packing a few things up and threw in the remainder of our groundbait when my tip arched over, only for me to miss it! I reeled in and was inspecting the pellet when Justin’s tip flew round and he shouted for me to grab it as the rod headed towards the river! I was expecting to feel a fish but there was no resistance and when I reeled in the hooklength had gone! We headed back to the car with the final scoreline 4-0 to the barbel! Fred hadn’t caught anymore but had fared better to finish 2-0 up. So another nice day in great company but another blank and these bloody barbel are as difficult to catch as those pesky mullet! I would just like to say a massive thanks to Justin for arranging everything and inviting me along, cheers mate.